T.R. 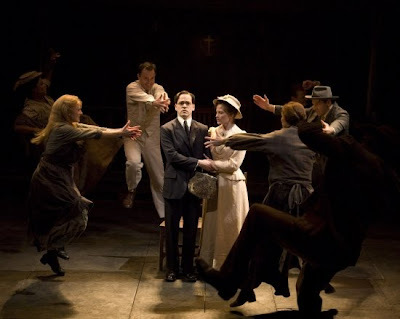 Knight stars as Leo Frank in "Parade"
This blog entry was written my my Dad, Jeff. Every so often I ask him to write a review of a show he's seen in Los Angeles. Check out his review of "Howling Blues & Dity Dogs." Who was Leo Frank? No, he was not Ann Frank’s father. And, while he was also a Jew, he was an American and not a German. And no, he did not die at the hands of the Nazis. He was lynched by Georgia whites in 1917 for a murder he may not have committed and after the Georgia Governor had reduced his sentence from death by hanging to life imprisonment. Why are we talking about Leo Frank? It’s because the play with music Parade is currently being performed at the Mark Taper Forum in Los Angeles . Fresh from runs in New York and London, where, respectively, it won a Tony award and was nominated for an Olivier award, an ensemble of about two dozen talented men and women deliver a powerful performance of this “musical” about a subject which, although almost 100 years old, still has relevance today in our “red state vs. blue state” reality.